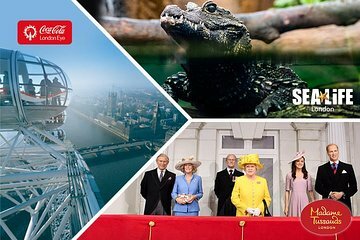 The London Eye, Madame Tussauds, and the Sea Life London Aquarium number among the British capital’s most popular attractions—and with this combo ticket, you have access to all three. Plan your sightseeing for a single day, or space out your visits; as the passes are valid for up to 90 days, you have the freedom to create your very own itinerary. Please note: The London Eye will be your first attraction booked with timed entry and cannot be changed. Your other attractions timed entry can be pre-booked through the supplier portal, refer to voucher for details. Alternatively your other attractions timed entry can be booked at the London Eye- first attraction booked.